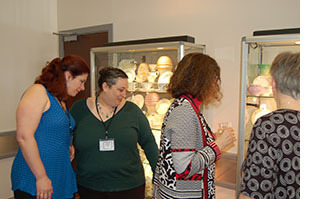 “Ooh that’s nice.” “Wow that’s fabulous” and “I’ve never seen that before.” Just a sample of the comments as wonderful treasures are carefully unpacked to go on display in the four cabinets reflecting talks at the latest Shelley weekend gathering. 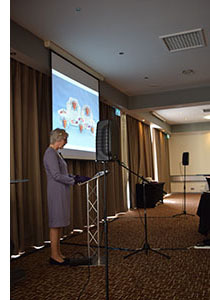 More than 50 members and guests stayed Friday night at the Holiday Inn, Telford and events began after dinner with a social evening where everybody was divided into nine teams to tackle a series of quizzes prepared by Olwen Dudgeon. Everyone but the winning team complained they were much too hard, but it got everyone talking. When membership secretary Elaine Whittaker finished totalling up the points the winners proved to be the Damson team, who generously shared their chocolates prize. Saturday began with those entering the Pot Show setting up their decorated boxes while those new arrivals not there to register the evening before were collecting their packs and specially produced Shelley bags. Chairman Gerry Pearce welcomed everybody including 13 visitors from overseas, before everyone rose for the National Anthem to reflect the arrival of a 'Royal' visitor' - Wileman’s Queen for the morning, Eileen Gore, complete with tiara. 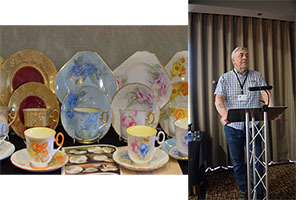 She and Carl had put together a beautifully illustrated talk on Wileman’s Royal Commemorative ware which is much more extensive than most people probably realised. 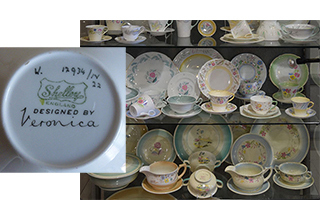 They believe Queen Victoria’s Golden Jubilee in 1887 was the first time the company had produced such ware, some with the logo Royal Jubilee on it. Some of the impressive pieces featured which really stood out included a magnificent earthenware teapot and later in her reign a colourful pin dish showing the Victoria Cross. Wileman even produced tea ware to mark Edward and Alexandra’s Silver Wedding a few years before he ascended to the throne as Edward VII. We also discovered that his coronation had to be postponed because of appendicitis but Wileman and other companies were allowed to sell items with the original date on. He was only on the throne a few years when more items were produced to mark George V succeeding him. The second talk of the morning came from Linda Ellis titled a Bryta Past on the nursery ware which was registered by Shelley in 1918. 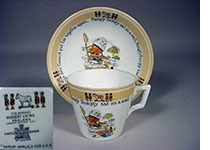 Inspired by W. Heath Robinson’s illustrations they are Mother Goose, Old King Cole, Humpty Dumpty and There was an Old Woman who lived in a Shoe, which appeared on the usual range of cups, saucers and plates, cereal bowls and on a double egg cup. 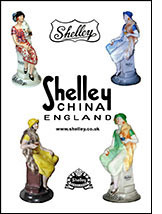 The range was produced until at least 1926 but as yet no one knows why Shelley used the name Bryta. 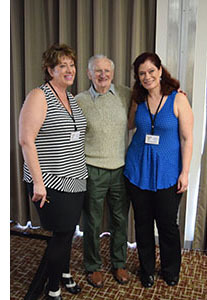 We then took an international flight to Alaska to look at Rochelle Hart and Roxanne Wilson’s collection complete with friends, those ranged from images of Bob Beatty to moose calves. While Rochelle has been collecting since 1995, Roxanne assured us she is not actually a collector, if she isn’t then there are a lot of non-collectors in the Shelley group. Tea ware, lamps and jelly moulds were just some of the items spotted and the gasp could be heard the other side of Telford when one picture featured a cup with a heart shaped saucer. A great double act which highlighted not only the joy of finding that new piece but also the friends you make along the way. After lunch John Barter introduced us to the Shelley patterns attributed to designer Veronica Ball, with the knowledge that her daughter Jane Cork, was a guest among those listening. One of her designs was chosen by the Ceramics Committee of the 'Britain Can Make it Exhibition' in 1946 which made her a tantalising subject to research. In the 1990s John and Linda began to collect pieces with a backstamp 'Designed by Veronica' apparently used 1938 to 1940, and he described the hunt for more. They could find no mention of her in the pattern books and inquiries showed she was moved out of the design studio after her engagement to John Thorley and then worked on the paintress’ benches where among other work she painted parchment lampshades to match the lampbases. John speculated because Veronica’s own sketch books had a split leaf design prominent, that other tea ware with a similar design, as early as 1935 may have been her work or were at least influenced by her. Although she left the factory on her marriage in 1948 he believes her designs were reflected in patterns until the 1950s. 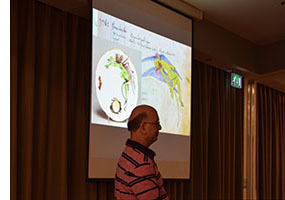 The scheduled speaker was not able to make it to talk about the Revival of Middleport Pottery, but Chris Davenport proved an able stand-in, with the help of a video, describing the work which had to be done to renovate some of the buildings and the new production now going on at the home of Burleigh pottery. After tea it was down to the official business of the Annual General Meeting. Chairman Gerry Pearce said he hoped the sound system at the weekend was an improvement on previous years as the Group had spent money to secure its own equipment. Membership was still dropping slowly and he asked anyone selling on eBay to include a leaflet on the group when they send their items as a way of reaching potential new recruits. 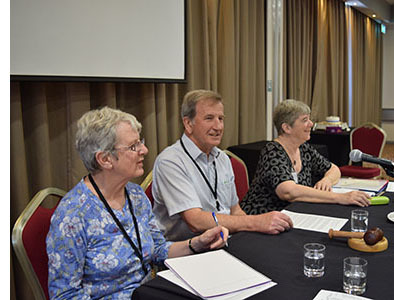 He said Brian Hill had now taken over as webmaster and Elaine Whittaker as membership secretary and thanked them and the rest of the committee for their support and hard work over the year. He especially thanked David Deller for producing four excellent magazines and said the editor would welcome more articles from members. There were still some vacancies on the committee being filled by people who already had one job, such as Linda taking on the work of Events Officer on top of being treasurer and urged anyone willing to take that job or support in other ways to get in touch. Linda said the group had made a loss last year but thanks to donations there was enough in reserves for subscription rates not to be increased. On the way to change for dinner votes were cast in the Pot Show. 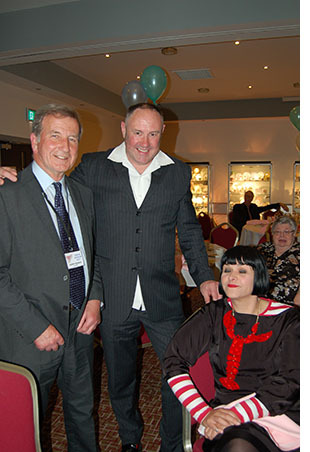 After a successful and interesting Silent Auction which raised £95 for the group, we enjoyed the Gala Dinner. followed by speaker, Keith Brymer Jones. He is probably best known as a judge on The Great Pottery Throw Down but proved to be an amusing raconteur about his own journey to become a master potter, illustrated with some amusing advertising videos. After discovering his love of working clay at school, he became an apprentice at Harefield Pottery in London. He then set up his own business making ceramics for retailers such as Laura Ashley and Habitat developing his own iconic word design. Through the television programme he found himself in Stoke and more and more drawn to the Potteries area, to the extent he now plans to set up manufacturing in the former Spode factory. He spoke passionately and emotionally about making use of the skilled workforce that still exists there and could appreciate what the Shelley Group does. A raffle for a cake made by Enid Foley, with a wonderful Queen Victoria icing on it, raised £200 for group funds and was won by David Cox. Voting was counted from the Pot Show and the rosettes and certificates were put out on Sunday morning with the Chairman, Gerry Pearce the delighted winner of the first prize with his entry 'In Sickness and in Elf'. Second was Steve Palmer with a topical 'Trees R May', and third with 'Duck a l’Orange' was Sheila Aves. A busy Mr. Palmer was then the first speaker of the morning with 'Lets Go Courting'. This was not a history of his wooing of wife Beryl but a colourful foray through the Late and Early Court shapes. He believes the Early Court had a very limited production mainly Floral Chains, but late Court had some popular patterns on it such as Phlox, Poppies and Spurge. When he started collecting them he read in the Shelley Style book there were 35 patterns, even after 15 years he still has less than half, so there cannot be lots of them out there on the market. But he also raised some questions, one being whether the early Court was reintroduced in the 1960s in a larger size. The debate continues. If anyone thought it might be difficult to find something beginning with H for this year’s snake they were proved wrong by a spectacular and varying display which John Barter described with enthusiasm. The line-up included hats, hair tidy containers, harebell, hibiscus, Hilda Cowham, hawking, hunting, horses, hawthorn, hollyhock, Humpty Dumpty, Hamlet, heavy bomber and a few home made in sugar icing by Enid Foley. Chris Davenport had also found some really unusual pieces and designs from the pattern books to conclude the talks. Ranging from fabulous toilet set jugs with ducks or quails on to tomato dishes and breweriana. But among those causing some excitement among the viewers were the Devil Subjects, grotesque bat figures designed by Blanche Vulliamy, which seemed a most unlikely image to have on tea ware Where are they now? None of those rare and unusual pieces appeared at the afternoon Bring and Buy but there was plenty to interest the enthusiast as well as a new Shelley tea towel to buy from the group shop. A raffle for a vase decorated by Ray Reynolds, which was returned anonymously to raise funds for a second time went to a happy Rochelle Hart. Then after a slice of another delicious cake made by Enid Foley it was time to pack up. However, the weekend did not end there for those lucky enough to be visiting Stoke Library archives on the Monday to see the pattern books. Imagine the excitement when we were greeted with the news that not only had the Zoo book, containing wonderful animal patterns, been found, but also an extra pattern book not seen before. The pages may have been curling up but even Chris Davenport found something new to look at while Bruce Till could hardly wait to photograph the contents. An excellent end to another Shelley gathering.